The Build Small Live Large 2015 Community. Photo by Love Ablan. 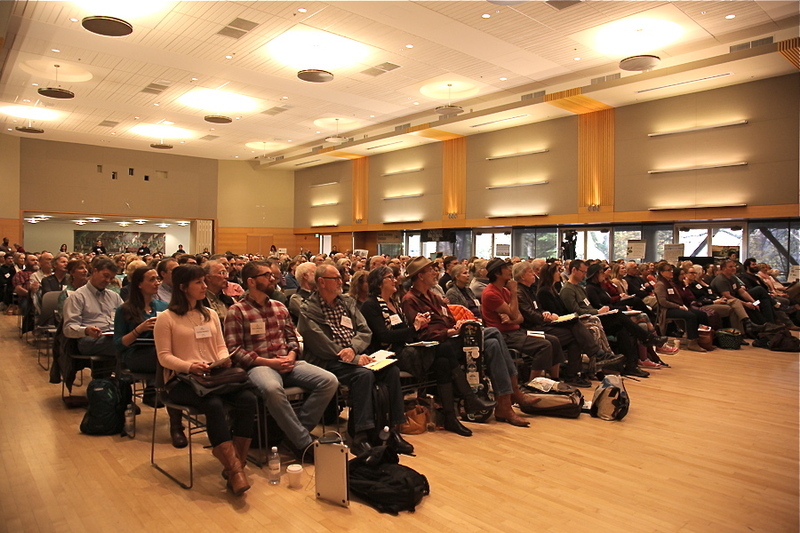 Five hundred designers, builders, planners, realtors, students and homeowners gathered in early November to learn how powerful and important it is to build small. The energy in ballroom that morning was electric, and the day was packed with people looking for new ideas for homes that match the needs of our current population: homes that can be flexible as families grow and change, homes that allow new ways to live together in communities of all sizes, and homes that are safe, legal and affordable. More than 95 percent of responding attendees said they learned something new. 70 percent said they came away from the Summit with a tool or resource they could use and share. 60 percent said they made a new connection. Alan Durning with Unlocking Home. Photo by Love Ablan. Alan Durning’s stirring keynote expertly summed up how our current housing challenges and policies came to be what they are today, and he articulated clear opportunities to improve our codes, and by extension, our lives. 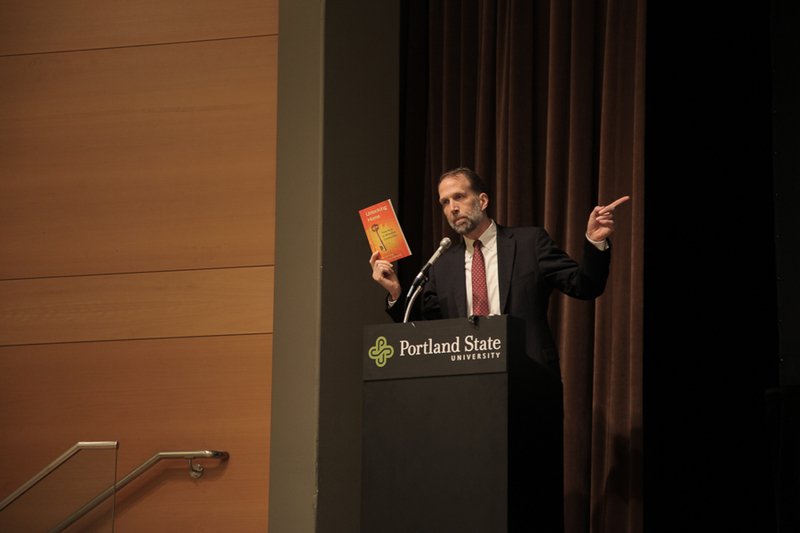 “Building small, or building normal,” Durning says, “is the centerpiece of Sightline’s work in the years ahead.” He outlined four strategies that require no additional funds from the city, yet would create greener, affordable, and much needed additional housing in the city of Portland. 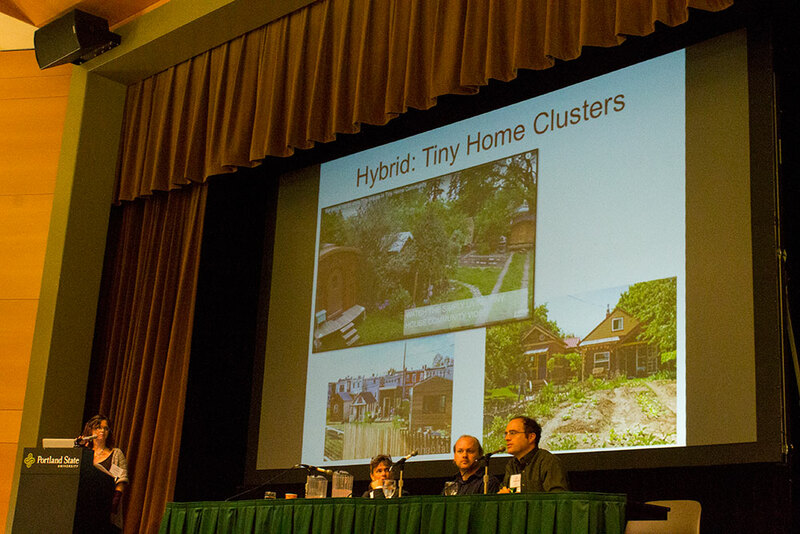 These strategies include removing caps on the number of unrelated roommates in a house, reviving Single Room Occupancy hotels (SRO’s), and encouraging ADU development. These strategies are outlined in his book Unlocking Home, and he offered a free digital copy to attendees if they signed up for Sightline Institute’s mailing list to stay informed about their important work. If you didn’t get a chance to sign up for Sightline’s emails and receive your free copy of Unlocking Home, email Sightline Institute’s Keiko Budech. Portland’s Residential Infill Project – In just about every session, someone asked how they could get involved and help make a difference in the movement. Locally, Portland’s Residential Infill Project came up again and again. This group of public officials and local stakeholders, including Eli Spevak from Orange Splot and Alan DeLaTorre from the PSU Institute on Aging, are taking on Portland’s changing residential landscape by investigating and discussing the “Scale of houses, narrow lot development and alternative housing options.” Their standing meetings are on the first Tuesday of every month and are open to the public. You can also join their mailing list to learn about additional events and meeting details. Eli Spevak, at right, with Kol Peterson, Dee Williams and Deb Delman. Small Developer Bootcamp – Developer, builder and designer Eli Spevak was everywhere at Build Small Live Large – presenting in sessions throughout the day – because he’s everywhere in Portland’s creative housing movement. From pocket communities on single lots, to multi-lot cohousing developments, Eli has a knack for building houses people really want to come home to, and finding creative legal pathways to make that happen. Now he’ll team up with other developers and trainers to teach others how to do work like this at a February 10, 2016 “Small Developer Bootcamp.” This one-day workshop will offer participants the “technical skills and resources to navigate development financing, zoning and entitlement, site selection, and building design in order to assemble your own small scale real estate deal.” Almost everyone at the Summit felt Portland needs more unique, small developments – maybe you could be among those creating them! Visit Orange Splot for more information and to receive an email when registration opens. Community Financing Mixers: “It takes a village to build a village.” Liz Getty from Urban Nest Realty spoke on the Policy Roundtable Session, and lamented that she had many clients and friends who want to live in small, creative developments, but first need to connect with one another to form their community and pool their funds to make something happen. Knowing that people are stronger together than they are alone, Liz is co-housing a set of “Community Financing Mixers.” The next event is on Tuesday December 15th. If you’ve been dreaming of building or living in some form of tiny house community, stop by! The Welcome Home Coalition – Affordable housing was on many peoples’ minds at the Summit, and many wondered what they could do to help Portland take appropriate action. This group was mentioned as doing some of the best community organizing on this issue in Portland. Take a look at their research, work, and consider donating to the effort. PDX ADU Class – If you attended Kol Peterson’s ADU development introduction session and want to take the next step, consider attending his all day ADU development class for the full experience. This class teaches homeowners to understand the design, permitting and building processes they’ll go through in order to save them time and money, and create an ADU that’s right for their specific situation. Kol and Eli both write regularly for AccessoryDwellings.org, Portland’s hub of ADU information, so keep tabs on this great resource if you think an ADU could be in your future. Tiny homes on wheels on display outside the Summit venue. PAD Tiny Houses – The legalities and practicalities of tiny houses on wheels came up frequently at Build Small Live Large. 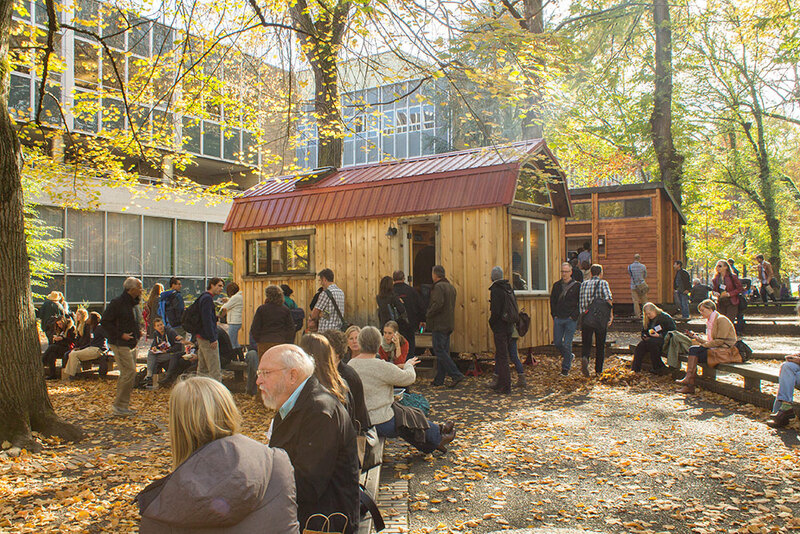 Visit Portland Alternative Dwellings’ for informative blog posts on how much a tiny house costs, how to find tiny house parking, how to grapple with legality, and much more. 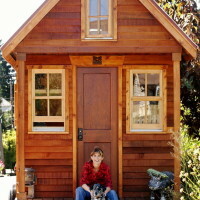 You can also learn more about Dee Williams’ book, and PAD’s tiny house ebooks and plans. Presentation Archives – If there were details or photos you missed during the sessions, visit the Build Small Live Large website to view the archived presentation materials from all sessions that were slide-based. You can also watch and share Alan Durning and Dee Williams’ great morning keynote. All of these events and organizations are doing what they can to make smaller, greener, friendlier, more desirable and more affordable housing a reality in their own ways, and they’d all love for you to join them in the movement. As Dee Williams asked in her morning keynote presentation, “Why do anything that doesn’t bring you closer and faster to the things that you love?” If you’re trying to create a place where you’ll love to live, we hope these tools will help you get involved and make it happen! Billy Ulmer is a writer and photographer who is fascinated with how our homes can support what's most important to us in life. He seeks out the people and organizations that can help demonstrate that a "dream home" is anything that helps you live your dream life. His work has been seen on Boingboing.net, ChrisGuillebeau.com, Treehugger, Tiny House Blog, Tiny House Talk, and he blogs regularly at Unlikely Lives.